Sweet French toast – famous French toast recipe with whole wheat bread, sugar, eggs, milk and honey. 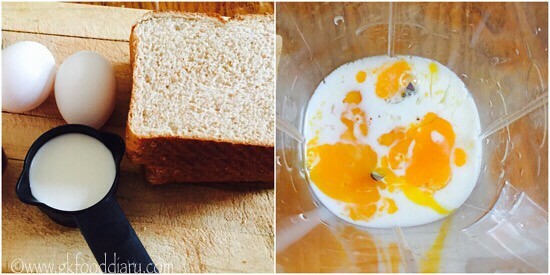 It’s a tasty toast recipe for kids, even fussy eaters can’t say a no to it! 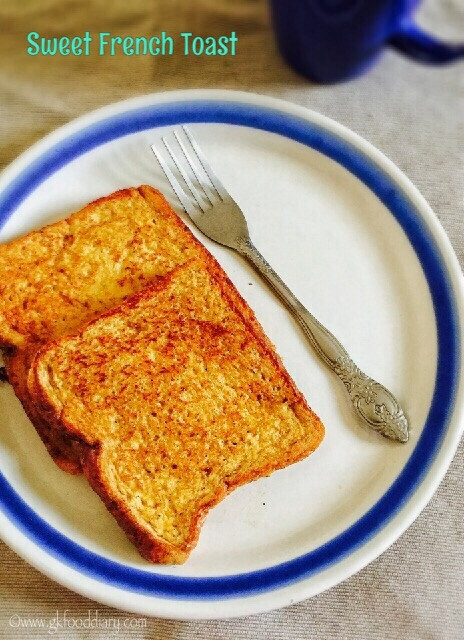 I make this sweet french toast occasionally when I pressed for time and want something really quick for a breakfast/snack.You can give this yummy French toast to your toddlers/kids after one year. It can be served with honey, dates syrup or tastes great even plain. 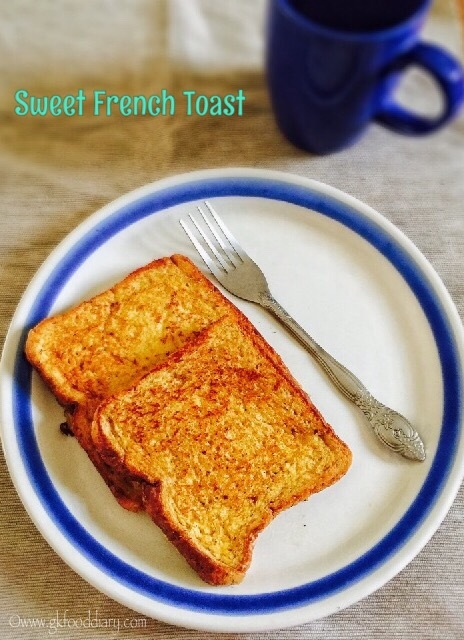 Let’s get on to check how to make this tasty sweet French toast recipe for toddlers & kids. Keep all the ingredients ready. Beat the eggs until frothy and fluffy with required milk. I have used the whip option in my blender. Transfer egg and milk to a bowl. Add sugar and vanilla essence. Now again mix everything together with a whisk until slightly frothy. Heat a tawa. Dip bread in the egg mixture on both sides. 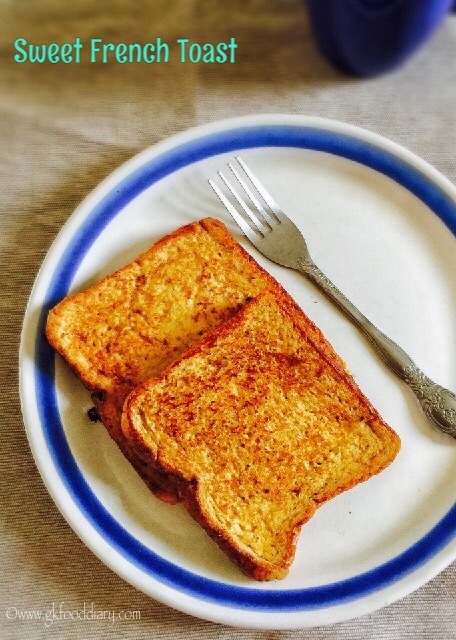 Immediately transfer the bread to the hot pan and toast it well on both the sides until brown by adding ghee/butter. 1. Keep all the ingredients ready. Beat the eggs until frothy and fluffy with required milk. 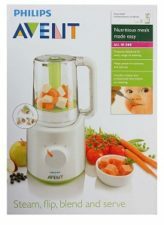 I have used the whip option in my blender. 2. 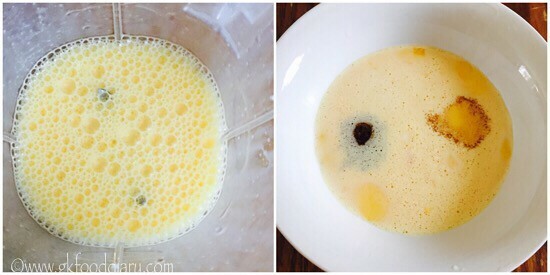 Transfer egg and milk to a bowl. Add sugar and vanilla essence. 3. Now again mix everything together with a whisk until slightly frothy. Heat a tawa. 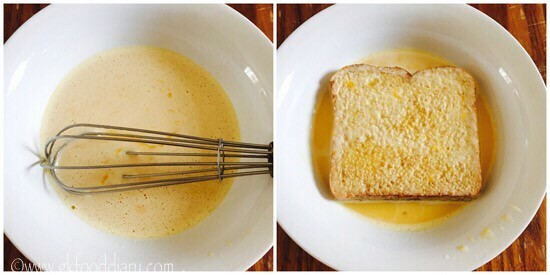 Dip bread in the egg mixture on both sides. 4. 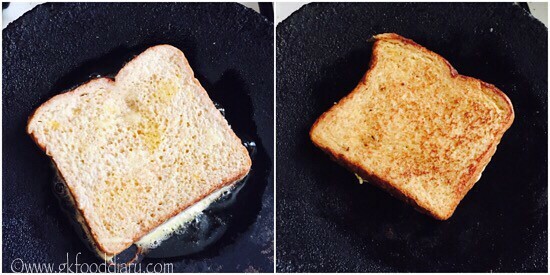 Immediately transfer the bread to the hot pan and toast it well on both the sides until brown by adding ghee/butter. The tasty French toast is ready ! Serve it warm with honey/ dates syrup or any fruits! You can use milk bread too. But make sure to adjust the sugar accordingly. Don’t dip the bread for more time in the egg mixture. But make sure to coat the bread well with egg mixture on all sides evenly.